It’s 9:00 am and the meeting hasn’t started because only three out of five attendees are present. The team silently waits for the last 2 members to join while secretly ruing the day they accepted the evite. By now, 10 minutes has passed and the final attendee joins stating she encountered connectivity issues. 5 minutes later, the meeting chair exasperatingly logs on explaining he misplaced the access code and was therefore denied entry. As a result, the meeting was extended by 45 minutes and as the call concludes, their all left feeling exhausted, frustrated and as if they had accomplished nothing. In situations like these, have we failed technology or has technology failed us? Traditionally, face-to-face meetings was the standard to which we based professional communication. But as more companies increase remote and flexible working teams, decrease meeting and travel-related costs and reduce commutes, alternative meeting formats such as teleconferencing make sense. It is advantageous as it allows professionals to connect, communicate and strategize in real time from different locations. 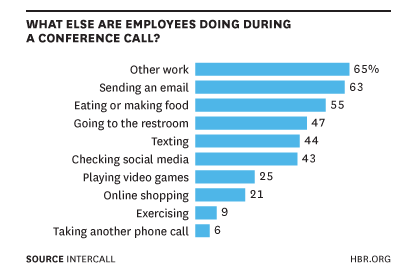 But, how we do ensure that our teleconference is truly productive and worth the time invested? Challenges with technical errors, connectivity issues, and communication barriers, can hinder the effectiveness and productivity of your meeting and lead to lack of engagement, motivation and morale among participants. To illustrate further, this popular video created by Comedians Tripp and Tyler perfectly depict the painful truths of teleconferencing and why it can be a painful experience: https://www.youtube.com/watch?v=DYu_bGbZiiQ. Meaning, every meeting, whether face-to-face or virtual, is unique with its purpose, goals, and objectives. The underlying issue is not whether we implement it but rather the way in which we conduct the call may not be working particularly well. Easier said than done right? Luckily, we have teleconference hacks which will take your next conference call from nay to yay! It may sound cliché, but proper planning really does go a long way. Ensure you plan for your participants by always asking these questions: What is the goal? Do you have an agenda? Are there any corresponding materials? Where will they be? How will they be connecting? Paul Argenti, Professor at Tuck Business School states that for the most part, teleconferencing planning is done very poorly. He uses a real-life example to illustrate: It is common knowledge that Paul would be travelling and driving up until the time of a call. The meeting chair sends Paul a document to read an hour before the call. That’s Poor planning. You can have impeccable behind-the-scenes planning but with poor implementation a meeting can be disastrous. For instance, the act of entering a mandatory access code and pin to enter a meeting has forced many scheduled meetings to start late and cause frustration among participants. A best practice is a one click link, no download and instant access into the conference. For example, the meeting chair can call the attendees in or they call in themselves with their own phone number. No more memorizing or fiddling with access codes. Start on a positive note by ensuring small details are properly planned. If you haven’t heard, humans have less of an attention span than a goldfish. Implementing and combining multi-sensory conference tools like web, audio and video forces your audience to be more attentive simply because there’s more stimulation. Your people skills can do the same. Take the first few minutes of every meeting to start a discussion, break the ice, and get people in the mood to listen to one another by simply discussing how everybody’s day is so far. Another way is to ensure to pause during discussion to allow for group input and encourage spontaneous discussion. CEO, Keith Fezzari of Ferrazi Greenlight, suggests banning the mute function altogether unless absolutely necessary because there is nothing worse than dead silence to kill the mood. Teleconferencing has the potential to provide many benefits, from spending less time away from home, more time on other projects, and having more money on other activities. With the proper tools, planning and delivery, teleconferencing has the ability to seamlessly perform its major function: facilitate communication and connect others easily; making day-to-day operations more effective to ultimately reach objectives. Do us all a favour and make your next teleconference less-cringe worthy. Implement some fresh ideas with one or more of our teleconference hacks to make your call a bore no more!